Clean rustic lines, iron drawer pulls and the option to customize the stain and finish make this piece a sure fit for your Mexico living room or Mexican bedroom. 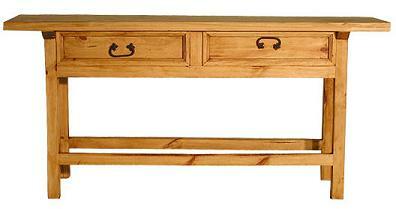 Great for smaller living spaces, or if you are partial to rustic but like to keep things simple, clean and understated. This table is almost Zen-like with its simple lines. We can also make it in Cottage Series finishes, so feel free to get creative!